Pierre Overnoy has a great sense of humor, and he smiles all the time. Steph Tissot dropped me at his house in Pupillin on Saturday morning; they hugged and kissed each other’s bald heads, and Steph said something to the effect of “see, Pierre; I’ve brought you a pretty young woman,” to which Pierre replied “yes, with a bad old man!” There was much laughter. He’s a flirt, Pierre, and a good-natured gentleman. You never know what you’ll taste, and you never know what he’ll talk about, but his statements are pearls of wisdom, and you can fill your basket at your leisure. We went into Pierre’s house, an ancient, low-ceilinged stone building that smells wonderful, of wood smoke and old things. There’s stuff everywhere: pictures and papers, the only evidence of technology a cordless phone that rang numerous times during our visit. There is nothing cold or modern about this domicile. It feels lived-in; it reminds me of houses I knew as a child including the one I grew up in. I could’ve stayed a long time in that house, basking in its warmth, clutter, and tranquility. When the group was assembled, Pierre poured us a 2012 Ploussard, bottled in September 2013. The 2012 vintage was small (though not as catastrophically tiny as 2013) and there was only one bottling of Ploussard. 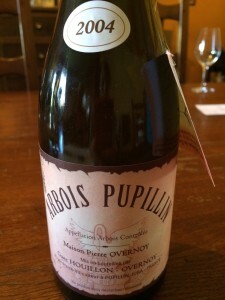 I mention this because Overnoy connoisseurs seem to like to distinguish between bottling dates. Pierre told us that he’d learned from Jules Chauvet that you’re supposed to sniff the glass within the first .08 seconds of the wine being poured, because the best wines are the ones that take the least time to open up aromatically. Well … I didn’t want to disagree, but having tasted a fair amount of excellent old Barolo that took eight hours to come around, I wasn’t quite in accordance. On the other hand, reduction is a huge issue with Jura wine, especially with Ploussard, and I do take it as a sign of quality when the wine is fresh as a daisy (and not smelling of farts) when it exists the bottle. The aromas were lovely right out of the gate, and even better after a few minutes. With wine in our glasses, we began to chat about the date of harvest for the 2014 vintage. The harvest takes place 100 days after flowing, and the 2014 vintage will be not unlike 2012. The wine began to get spicy and herbal with the telltale pomegranate and orange rind notes of Ploussard. From five or six different plots of vines of different ages all in and around Pupillin, Pierre explained that there was a very nice plot on the road to Arbois, but they had to replant it. “How soon after pulling up the vines can you replant?” My good friend and Jura wine writer, Wink Lorch, asked Pierre. Answer: “you should wait 20 years!” The soil needs that long to decompose and rebuild itself, but in reality, five or six years is a reasonable amount of time to wait to replant. On the palate the wine was at once silky and crunchy, with the zesty flavor of fruits seeds. Ploussard is a (relatively) big, thin-skinned variety that packs a serious punch of mouth-watering acidity, and seems to absorb and give back the limestone and marl soils of the Jura. It’s the ultimate expression of Pupillin, and – even if not every bottle you drink is perfect – there’s no better rendition than Overnoy’s. We spoke about cultural differences in the way tasters receive wine. Pierre recounted a story of a Japanese visitor who pointed out not the details of aroma and flavor, but rather the way the wine made him feel, and the sensations in his body as he swallowed the wine, alive and energetic. Clearly, Pierre liked this approach. Wine is nourishing, like food. (Consider the French word: “digeste!”) I can tell you that having watched – on the plane on the way to France – the documentary ‘Somm’ about Master Sommelier candidates, I reveled in Pierre’s intensely spiritual rather than fiercely analytic (and in my humble opinion totally soul-less and ridiculous) approach to wine tasting. We came to one of Pierre’s controversial beliefs: namely that the alcoholic effects of wines without sulfur are less than the alcoholic effects of wines with sulfur. “Sure! That’s what we’ll tell the officer when he stops us on the road back to Arbois!” He recounted a tale of a friend who had been to lunch with about eight sulfur-free wines. Apparently Pierre’s crony was stopped on his way home, and when tested showed no evidence of alcohol whatsoever! If we doubted the veracity of this tale, we certainly didn’t say so. Next we tasted 2009 Chardonnay. “This wine is just beginning to get really interesting” Wink pointed out. “All the Chardonnays,” Pierre responded “are better in 10-15 years.” For the uninitiated, it’s a more difficult wine than the 2012 Ploussard, though this is an apples-to-oranges comparison. The wine has a bit of funk and VA, but a glorious, soaring, high acid palate, and a lightly tannic finish. Changing constantly in the glass, its light oxidation and deep earthiness mean that it won’t be for everyone, but for lovers of the style (and perhaps with a roast chicken), it’s superb. “How do you know whether it’s Chardonnay or Savagnin?” One taster inquired. It’s the color of the wax. White wax is for Chardo; yellow wax is for Savagnin; green wax is for a blend of the two. “Do you make the blend every year?” I asked Pierre. In fact they rarely make the blend, and only in vintages when the Chardonnay is a bit heavy. Savagnin brings acid and freshness. “Of course there’s a choice” Pierre pointed out “between blending at the harvest or in the winery.” When the grapes are co-fermented, it takes much less time for them to integrate; when they are blended after fermentation, they will take much longer to marry, and Pierre thinks that after some time, no matter the ratio of Chardonnay to Savagnin, the Chardo will assert itself more strongly. Every wine at Overnoy (except for Vin Jaune, which we did not taste) is made topped up, or ouille, we were reminded in advance of tasting 2004 Savagnin out of a 500 ml bottle, which is the typical size for this wine. The wine was absolutely gorgeous, with aromas of cashew and hazelnut, ripe yellow orchard fruits, spice, Comte and chicken stock. Delicious oxidation on the nose and creamy texture on the palate were balanced by razor sharp, mouth-watering, acidity, length, and firm structure. I’d tasted this wine once before, the general policy each time our allocation arrived at Chambers Street having been “family hold back,” and this bottle was far better than the last I’d tried. I was pleasantly stunned; we all were. It was a beautiful showing. 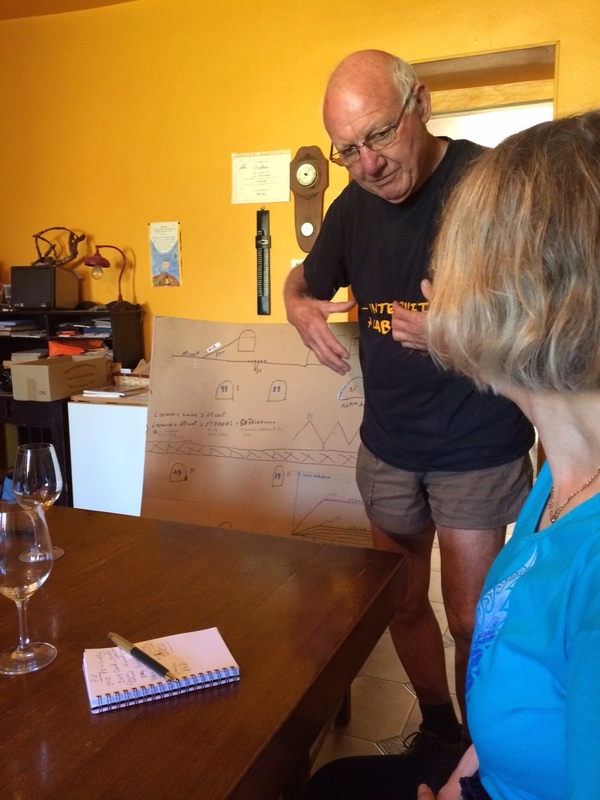 Pierre told us that he was going to lead us through the chemical process of Vin Jaune-making with the aid of a cardboard box. He brought over a deconstructed cardboard box with an extensive diagram drawn on one side. As Wink wisely pointed out, it’s better to relay less information correctly than to relay more information incorrectly, so I’ll limit my recounting of this lecture on the development of the molecules Ethanol and Sotolon. (You can consult Wink’s book if you’d like to learn more.) Suffice it to say, there’s a major difference between Vin Jaune that matures in an above ground cellar, and Vin Jaune that matures in a below ground cellar. As any Sherry aficionado will confirm, climate conditions have a huge impact on the development of flor – or voile as they call it in the Jura. Overnoy prefers the below ground cellar, where the maturation process takes much longer (Overnoy’s Vin Jaune ages for up to 14 years; the current release is 1999). He believes that long, slow aging helps the wine develop finesse, more spice and curry aromas, versus the apply, nutty qualities of Vin Jaunes that age more quickly above ground. I’m already afraid I’ve said something wrong, so I’ll stop here. If you should be so lucky as to find a bottle of Overnoy Vin Jaune, you’ll have no shortage of drinkers willing to share it with you. We spoke about natural winemaking. Pierre reiterated something I’ve known for years, namely that natural winemaking begins with absolutely impeccable vineyard work: living soils, and healthy yeast populations. Under these conditions, with a clean winery and temperature control, you can make very good chemical-free wine. Working without chemicals is not, he said “the birds are singing and we’re going on holiday.” Too many people think they can do nothing in the vineyard and make wine without chemicals, and the result is bad wine that is sullying the reputation of the category. Well, I may not share Pierre’s conviction regarding sulfur and the effects of alcohol, but I whole-heartedly agree with him on this fine point.